Shown here is the same pattern on a soup plate without the overglaze enameling. This example has the engraver's mark "Wear Sc" included in the central pattern. 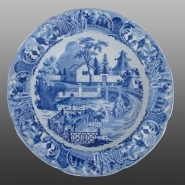 This plate is included and discussed further in the exhibit.